Tayeh is an English literature student at Gaza’s Al-Azhar University. She was born in Gaza and lives in a refugee camp called Jabalia in northern Gaza. Leen is a freelance journalist and has B.A. in English and French Literature. 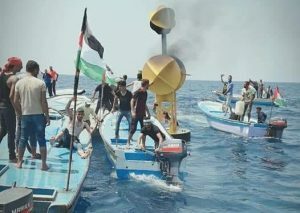 See piece from the group: “Boat from Gaza attempts to break Israeli blockade” that profiles a wounded protester seeking treatment outside of Gaza.